Think training your cat is an impossible task? They can be moody, seemingly disinterested, and have a sassy attitude but training your feline friend some basic — and super helpful — tricks is much easier than you might think! They are extremely smart creatures that, despite their reputation, are very apt at learning new and repetitive skills. Whether it’s teaching them how to sit, training them to come when you call them, or even giving you a shake with their paw — it’s all possible to teach your cat these fun and useful tricks. But first? Some basics. 6.7 Jumping Through Hoops — Literally! Contrary to dogs, cats are extremely independent. Cats have been brought into households throughout history for pest control but it was always performed on a very independent (and even selfish) reason. This, however, does not mean that they can’t be trained. It does mean that it will take a lot of practice, time, and patience. But they’ll get there! It’s really that simple! But when it comes to negative consequences…this brings us to our next short topic. 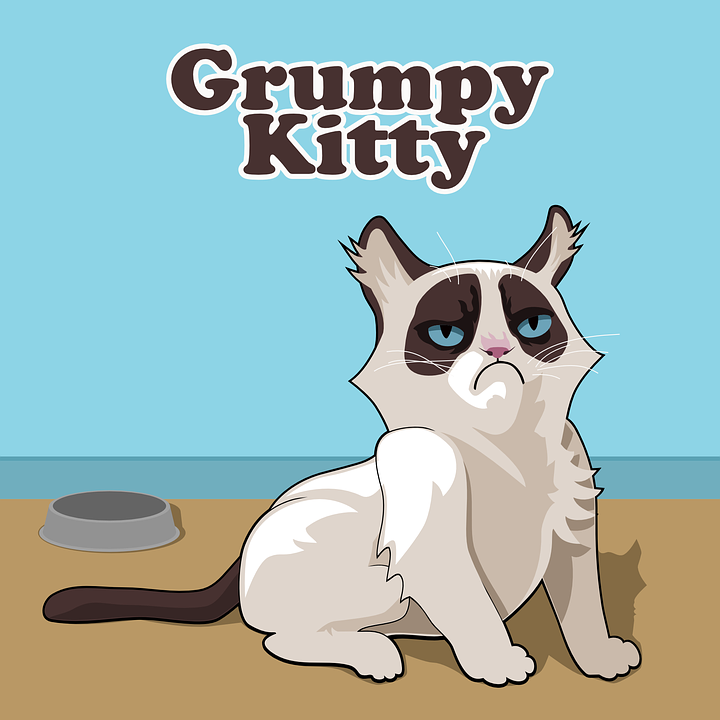 Cats, although temperamental, are sensitive creatures. They take your interactions with them very seriously. Before moving forward with a training program for your kitty — be sure to keep this in mind. 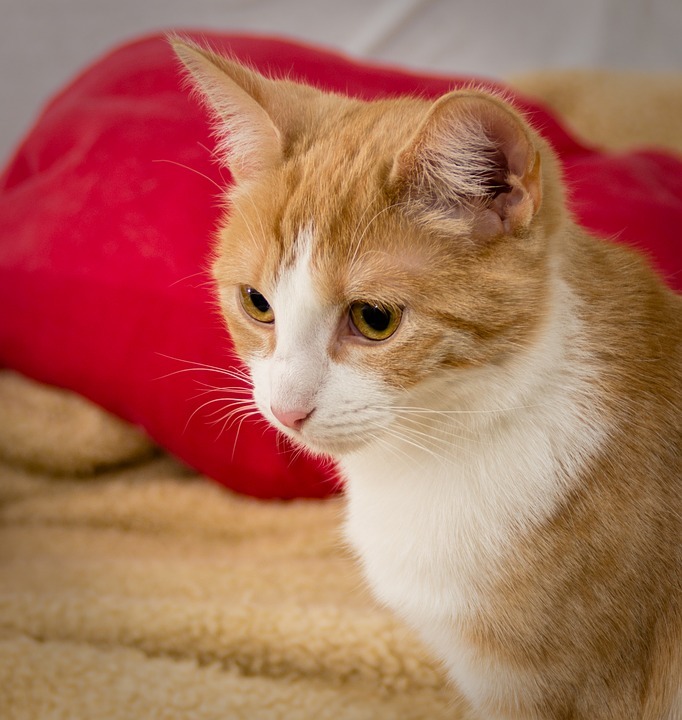 “Punishing” your cat cat lead to stress, which then leads to behavioral and health issues. Before we get into the details of training your cat specific tricks (below), it’s important to note that, like training dogs, the use of treats is involved. This is the best and most efficient way to “condition” your kitty cat into repeating a positive behavior. Here is another area where cats and dogs differ. Dogs will pretty much eat anything and everything that is put in front of them. But cats? They’re picky! There are plenty of snacks on the market that are tailored to cats but the simple use of chicken or tuna is just as efficient. The main issue that you definitely want to avoid is overfeeding. Please make sure you limit the amount of treats you feed your furry friend. Too many treats can cause obesity which is a serious epidemic in the feline world. 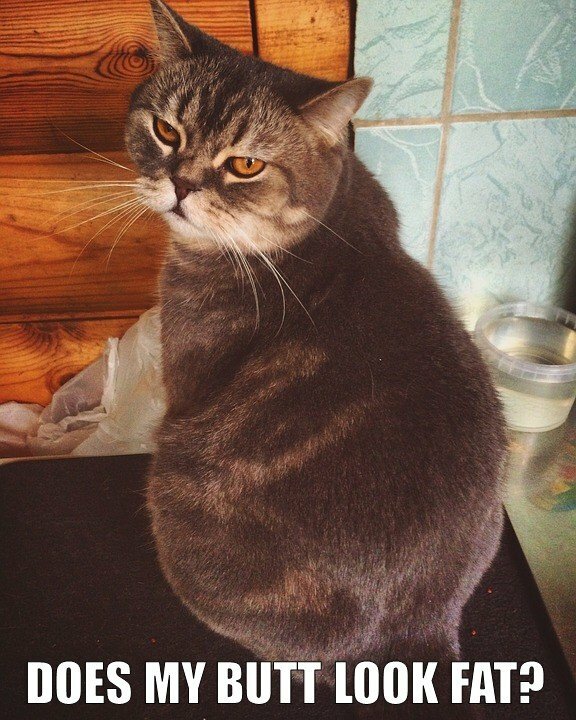 In fact, a 2011 study showed that over 50 percent of cats were either overweight or obese. It can lead to a variety of health problems that no one wants their cat to go through. Please keep this in mind before starting a training regimen — and to help prevent this from potentially happening? This takes us to our next topic. Let’s face it — our sweet cat’s attention span is just not that long. They become disinterested and “bored” quickly. Whatever it is that you’re trying to train your cat, pick just one trick at a time, be passionate and adamant about training them, but let each lesson determine how long they are willing to spend learning. It’s important not to overwhelm or confuse them with trying to teach them more than one trick or skill at a time. It’s also important not to force yourself upon them when it comes to training. For example: if your goal is to train them to play with a certain toy (more on this below), they need time with the toy by themselves first. Cats like (and need) to have their space respected. Once they’ve become comfortable with the new toy — this is when you can start participating. Now! It’s on to the fun stuff! Let’s start diving into the specifics of some fun tricks and skills that you can train your cat to do. Teaching your cat (or dog) how to sit is one of the best first tricks you can teach them. It’s a wonderful building-block skill that they can use to learn other tricks in the future. And as mentioned earlier, the best way to get their attention to start training? Food! After that? It’s just practice, practice, practice. Start by holding a treat or a piece of their favorite food above their ears by just a few inches. Slowly move the treat back towards their tail which will force them (hopefully) to take a seat in order to see (and grab!) what they want from your hand. After a successful sit, or even a close completion, reward them immediately for their good behavior. Practice and repeat until the skill is mastered. It’s helpful to try and complete the newly learned skill in multiple areas around the house as well to make sure they don’t get used to acting a certain way in just one spot. Once you’ve got “sit” down pat — it’s super easy to move on to the next trick! 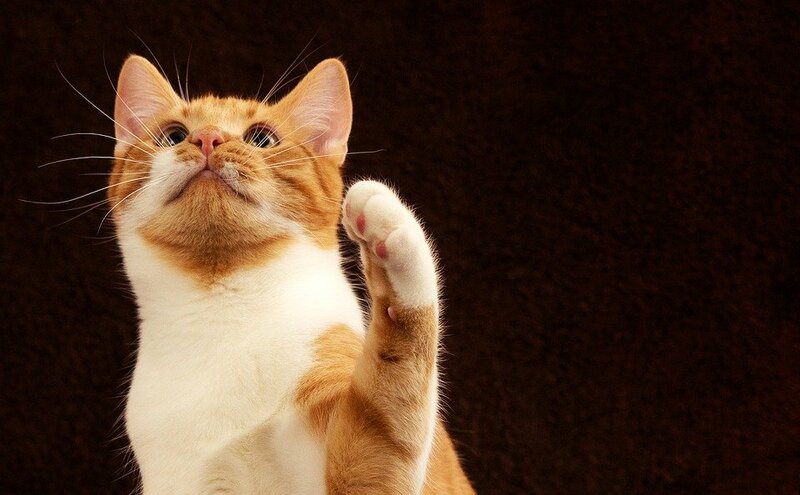 Okay — so the word “beg” is never good but kitties sure look cute when they have their paw out asking for something. So, let’s call it a high five! Begin the exact same way as “sit” by holding a treat or piece of their favorite food above their ears by just a few inches. Instead of moving the treat back toward their tail, move the treat up and away from them encouraging them to stand on their hind legs. Once on their hind legs, wait for them to use a paw to “beg” or ask for the treat that you have in their hand. Or say “high five” until they stick out their paw. Immediately reward them with the treat after they successfully stand and paw or high five you. You can practice this skill with your cat until they stand or “high five” without needing the treat being dangled. But, of course, if they do it successfully it’s important that they are rewarded. Start by making a specific and distinct sound before feeding your cat. Make sure you make the noise before you open the can or bag of food. Your cat will begin to associate this noise with something they like…of course…that “something” is food. Once they have started associating this sound with food, try making the noise outside of feeding times to encourage them to come to you. Be sure to reward them with a treat. Start with short distances and slowly increase the distance over time. Again — always reward a behavior when they complete it successfully to encourage repeat conditioning. This one might sound a bit crazy for a cat trick, right? We promise it’s not! It’s actually much easier than you’d expect and it just takes a bit of time and repetition. Have a piece of their favorite food or a treat in your hand and make yourself eye-level with your cat. When they move their paw or successfully bring their paw up to your hand, reward them with the treat. Repeat this training technique until your cat responds to the word “shake” without having to touch their paw. This one can be a bit trickier and more time consuming so be patient with your furry feline. It may seem confusing to them at first so stick with it until they’ve mastered the command. The first thing to keep in mind here is that a leash meant for a dog will not work for your cat; in fact, it can damage your cat’s trachea. 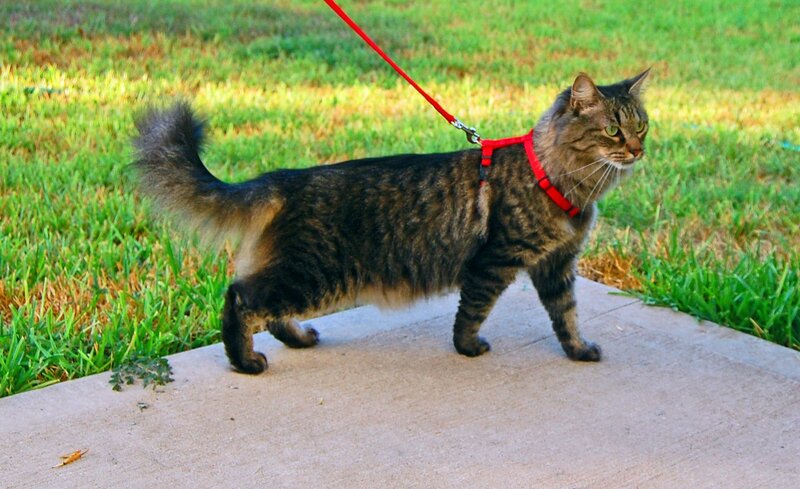 Be sure to purchase one that is specifically made for a cat is in harness form — the leash should attach to their back, not their neck. Start by letting your cat where the harness in your home. Reward them for every successful session inside your house. Your cat might be scared of being outside at first. First begin with a trip to just right outside the door and standing with them for a few minutes. Reward the behavior. Continue to increase your distance from your door with constant praise, patience, affection and reward. This skill might be very difficult for a cat who has been used to only being inside. Be sure to never force them or pull them in the harness — this can be traumatizing and make them feel like they can’t trust you. It’s all about baby steps with this one. This is an excellent trick to teach your cat if they spend a lot of time outside. Teaching them to ring a bell to alert you when they want to come back in can be peace of mind for both you and your cat. Suspend a small but loud bell on a string at your cat’s eye level outside the door they enter and leave from. If they typically scratch or meow to come in — ignore their efforts. Eventually your cat will try batting at the bell and string at which point you can open the door and reward them. Repeat until this behavior is learned and performed deliberately without any scratching or meowing. This trick is wonderful for cat parents that worry their cat may want to come inside at night after you’ve gone to bed or if you’re in another room. It’s a great way to learn communication and trust as well. Jumping Through Hoops — Literally! Now that you’ve mastered some more practical tricks — why not take it to the next level? Teach your cat to jump through a hoop! It’s an easy way to impress your friends and family — all it takes is a little luring. Start with a target that you want your cat to “chase” aka a treat or piece of their favorite food. Hold this piece of food on the same side of a hoop so the cat can follow it through the obstacle at first. 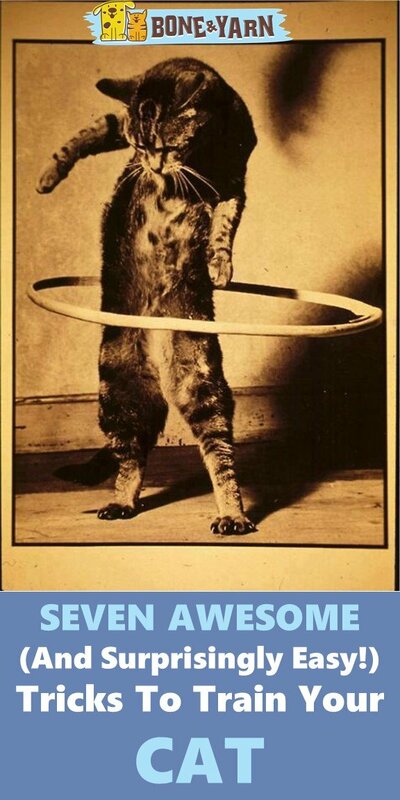 Lead your cat through the hoop with your “lure.” Reward if successfully completed. Soon try holding the treat on the opposite side of the hoop until they have learned to jump through it. Cats are super smart and catch onto things quickly. They may be hesitant to jump through at first but practice makes perfect. You can even try having them go under or over the hoop depending on how and where you lure them. Training your cat may seem like an impossible task at first but, rest assured, it’s very possible. Your cat may require more time and more patience than it would to train a dog but positive reinforcement goes a very long way. Practice, practice, and practice again with the concept of operant conditioning. You’ll have a well-trained kitty in no time!